As promised, here’s the second installment of what to do in the Riviera Nayarit for sports lovers, with a focus on the beaches and mountains of this gorgeous destination. Let’s start with the beaches, where there are plenty of group sports to practice, whether you’re looking for friendly competition or a more professional challenge. One of the most popular games in Mexico is a pick-up round of soccer, and thanks to the Riviera Nayarit’s expansive beaches you’ll find them going on most commonly in Nuevo Vallarta, Bucerías and Destiladeras. Beach volleyball is another favorite and there are even professional-level tournaments going on in Rincón de Guayabitos. 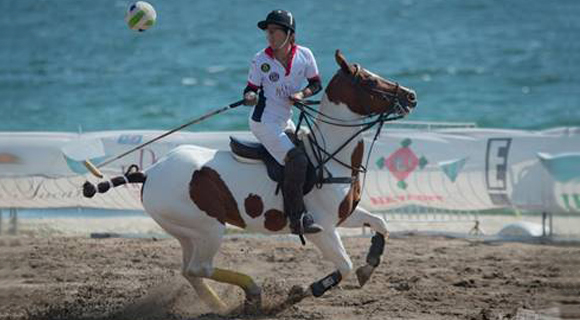 Nuevo Vallarta has become known for its Beach Polo tournaments, a relatively new way to practice this discipline. And animals love to play on our beaches: just throw out a ball or a Frisbee! Mountain biking is one of the hottest sports to hit our slopes. Higuera Blanca is a good place to practice it—the area hosts a competition as well as part of the triathlon that takes place in nearby Litibú. If you prefer open-road cycling, our byways are long and well-kept, many with inspiring views of the ocean. You’ll find some great straights along Bucerías, La Cruz de Huanacaxtle, Punta de Mita and Litibú. It’s also common to see marathon runners and power walkers hitting the road to Punta de Mita. And don’t forget that several of our microdestinations have sports arenas with soccer, basketball and volleyball courts, or even baseball stadiums. If you’re a proponent of the sporting life, you won’t miss a beat when you come vacation in the Riviera Nayarit!